This Post has already been read 515 times. Social Media Summit 2018 is going to be one of a kind, the appreciation it is receiving after its announcement is tremendous, and people are really looking forward to gain from this event. 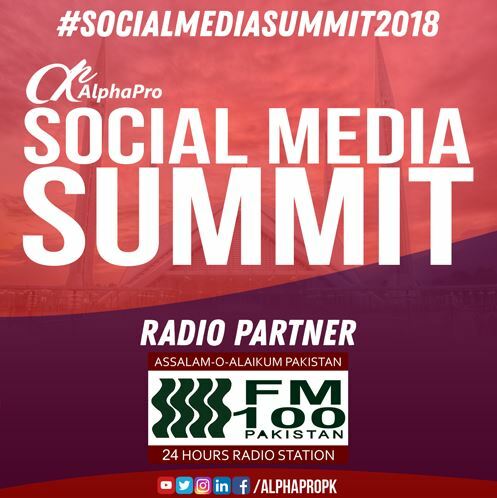 FM 100 has joined the Social Media Summit 2018 as the official radio partner of the upcoming event. FM 100 being the pioneer in Pakistan’s radio transmissions is supporting the event as it is adding to the development in Pakistan and is beneficial for the growing trend of fast growing social media and its positive benefits for us as a nation. The Social Media Summit is focused on bringing together all the positive media forces to reach masses and guide them towards the positive and fruitful benefits and uses of social media. People have a very vague idea with respect to what uses social media can provide the summit will give a broad idea and clarity.